Rhonda worked at a prestigious art museum locally for three years in the development (fund-raising) department. The experience was trying at times as many non-profit jobs are, but that had nothing to do my presentation. I did my best and immensely enjoyed being "all dressed up with somewhere to go". I think I was overall respected. The absolute best thing that came out of the experience were the friends that I made. We all have work friends that come and go in our lives but some are true keepers. You all know who you are. These are the ones that tell you what they really think and long after the job is gone you still have lunch, dinner and share news. Nancy is one of those friends. An intelligent woman who still works and is currently enjoying her daughter and two grand children. Pictures were shared. Go Girl - You have earned it. Nancy and I had dinner almost exactly a year ago and I shared much that was private when we worked together. There are some personal thing that are not discussed in the professional environment that need to be shared as the friendship changes from work to personal. I did just that. Nancy, being the beautiful person she is listened and ask questions. She did not run away in horror and I am very happy to say is still my good friend. Nancy, know I am always there for you. Note to future self: "Sometime friends can be more open than we anticipate." That bring me up to last week's California trip. 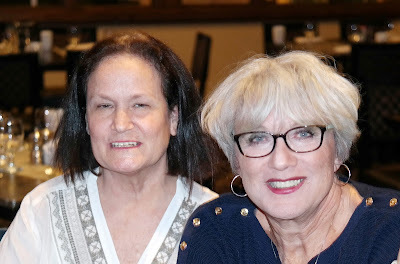 Nancy and I had another marathon dinner - same restaurant, laughed, told stories, caught up and really did not want our evening to end. So wonderful to see you and share again. Nancy, thank you for being my friend, allowing me to talk-on and for sharing your incredible life with me. Good luck on your "Going Grey Looking Great" journey. It works for me. Same time next year - if not before! lot about your destination. See the link below for more info.